reviewing all things Cape Fear Coast! Bakeries. The yin to my yang, the Sonny to my Cher, the light of my life…the reason my lower stomach (which I fondly call “my pooch”) has taken on a mind of its own. All joking and stretch marks aside, pastries, cakes, and desserts of all sorts are my reason for existence. Therefore, when we moved to Wilmington, NC, I was heartbroken that the delicious goodies I had scoured and labeled as “my babies” would no longer be accessible. What is a chubby, choco-craving girl to do? FIND NEW GEMS, BUT OF COURSE! Apple Annie’s is a well-known bakery in Wilmington that has two locations, one on South Kerr and one on Military Cutoff. I have yet to try the Military Cutoff location, so I can only vouch for the other. The first thing I noticed about AA’s was its selection. Everywhere else that has offered desserts in the Cape Fear area has had slim pickings, this is definitely not the case with AA. Whatever you dream is your hearts desire here…from german chocolate squares (delicious) to the cinnamon croissant (amazing) to white chocolate macadamia cookies (have yet to try), AA’s will surely have something for everyone (they even offer sugar-free goodies!). The customer service is absolutely amazing as well. Not only do the employees allow you to take your time, they also offer words of encouragement to lead you along your artery-clogging way! I really do love this place. However, like everything else, there are SOME drawbacks. First, there is nowhere to sit in the bakery, it is set up so that everything you buy is to be eaten at home or somewhere else. Second, all of their offerings are refrigerated, even items that should be warm (such as a croissant). This could definitely become an inconvenience to anyone who would like to enjoy their selection pronto. My suggestion is either wait till you encounter a microwave OR kindly ask one of the employees to heat it up for you (I don’t see why they wouldn’t). Finally, while YAH may disagree, I think that though their quality is always worth the price, their quantity isn’t. I understand that not everyone wants a cupcake the size of their head (you would be stupid not to), but selling a cheesecake morsel for $3 seems outlandish. Again, this last complaint could be due to my pooch’s impressive mind control and constant need for fatty goodness. 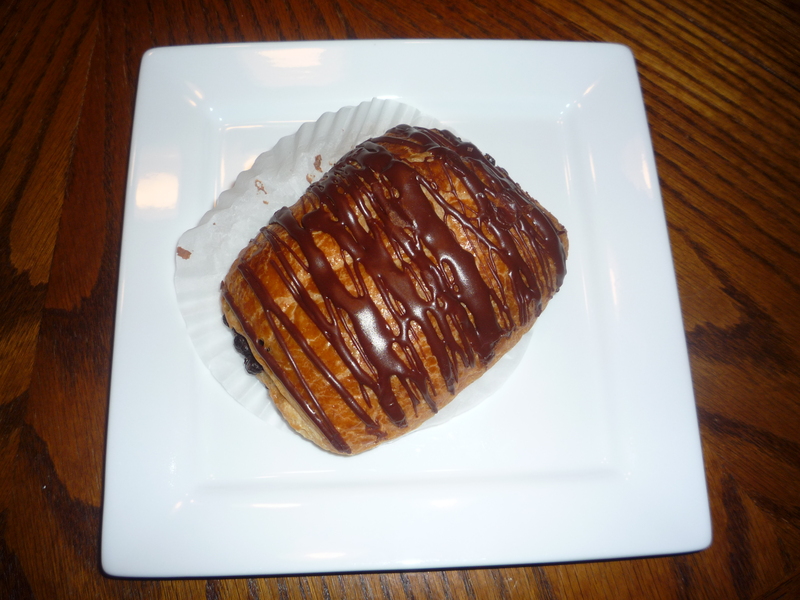 Today I sampled their chocolate croissant. Right off the bat I was pleased with it’s size and obvious cholateyness…I mean, check out that drizzle and ooze seeping from the middle! When I got home, I ripped this sucker out of its pretty package, stuck it on a plate, and microwaved it for 1 minute. I used a fork to eat it, but most people would just grab a napkin and shovel it in. The pastry itself wasn’t crunchy but light and fluffy (not soggy at all). The chocolate middle was warm, gooey, and sinful. This baby is not meant for the kiddies or wimpy milk-chocolate lovers…this one is stuffed to the gills with semi-sweet chocolate. The richness of the chocolate paired with the mildness of the pastry (it wasn’t very sweet), makes for a yummy snack, and dare I say it? A rewarding breakfast treat? (It’s acceptable as long as skinny french people keep eating them for le petit déjeuner as well.) Overall, I definitely recommend this beauty. It’s worth both the $2.50 I spent AND the extra mile I’ll have to run tomorrow. Apple Annie’s is definitely one of the best bake shops, if not the best in Wilmington. 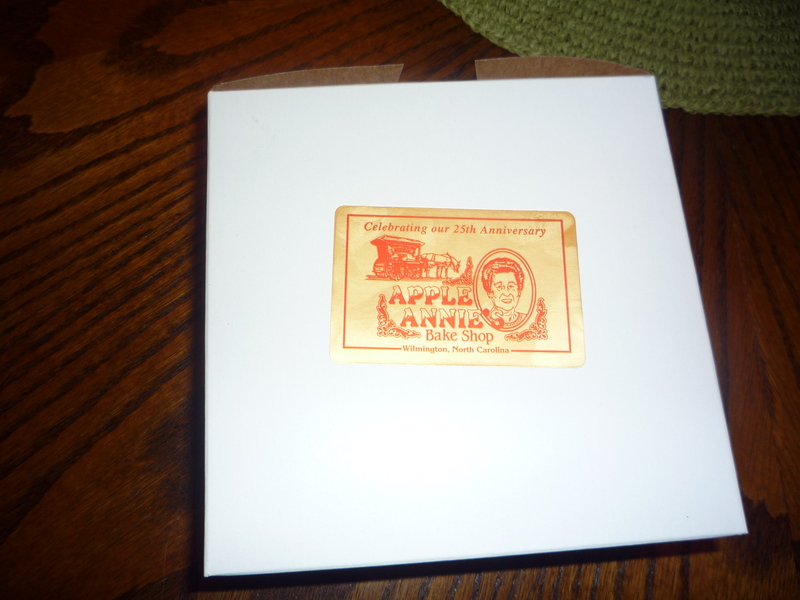 I have purchased goodies from many bakeries (NJ, NY, SC, and California) and this one ranks right up there. So far (third visit so far as we just recently discovered this little local gem) almost everything I have eaten there was delicious, the service was great and the prices reasonable for the quality of their smaller treats. Hats off to this bakery! Today I ate their Reese’s peanut butter bar and it was out of this world. 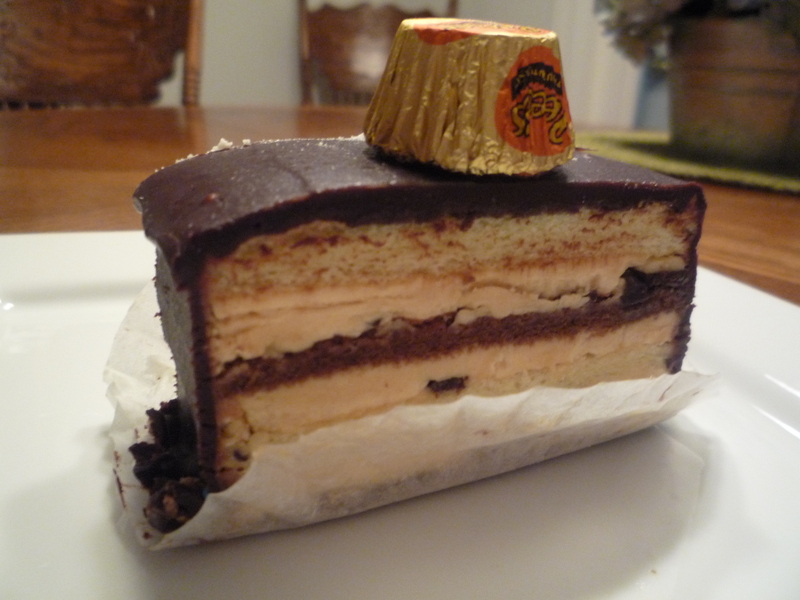 It is layered with a yellow cake and what I presume (hate the word assume) is Reese’s peanut butter mousse surrounded by a delicious dark chocolate. Nestled on top is a small Reese’s peanut butter cup. This delectable goodie is not overpowering with sweetness and allows the diner to walk away without that heavy feeling. You can be sure I will be buying this baby again in the future. For $2.50 plus tax I think it is definitely a sweet dream! Now on the down side, I was completely disappointed with their carrot cake square. Oh bombs! And a big one at that! Now I will fess up that I am a traditionalist when it comes to certain desserts but willing to give a new twist a try. But….this twist just turned me the wrong way. 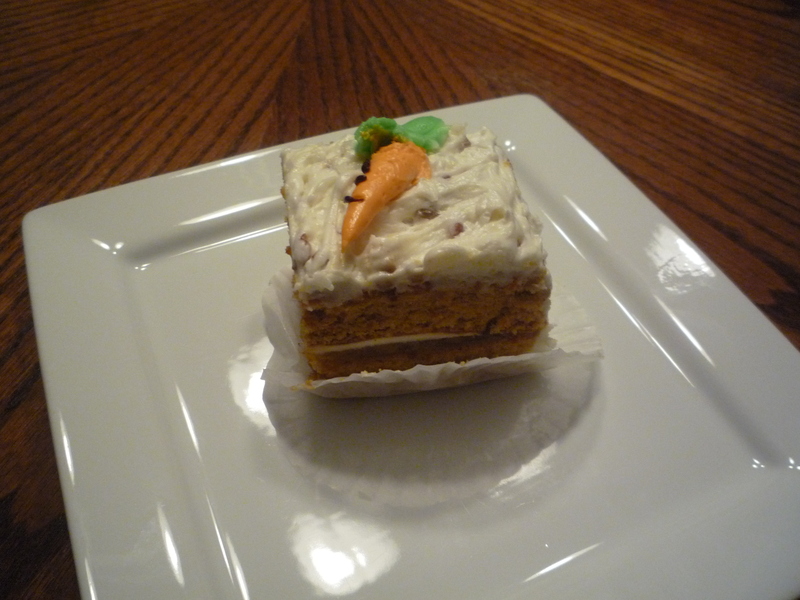 It was composed of carrot cake with this foreign substance in the middle. After some contemplating I determined that the baker had choosen to layer in either a pineapple or orange marmalade. Gross!!!! And then to add to my dismay, the icing was buttercream instead of the standard cream cheese icing. All in all, a terrible combination in my opinion. Maybe if the icing was the traditional cream cheese icing, I might have been able to stomach the marmalade but with that combo it was way too sweet for carrot cake. Oh well…back to the drawing board for this one! 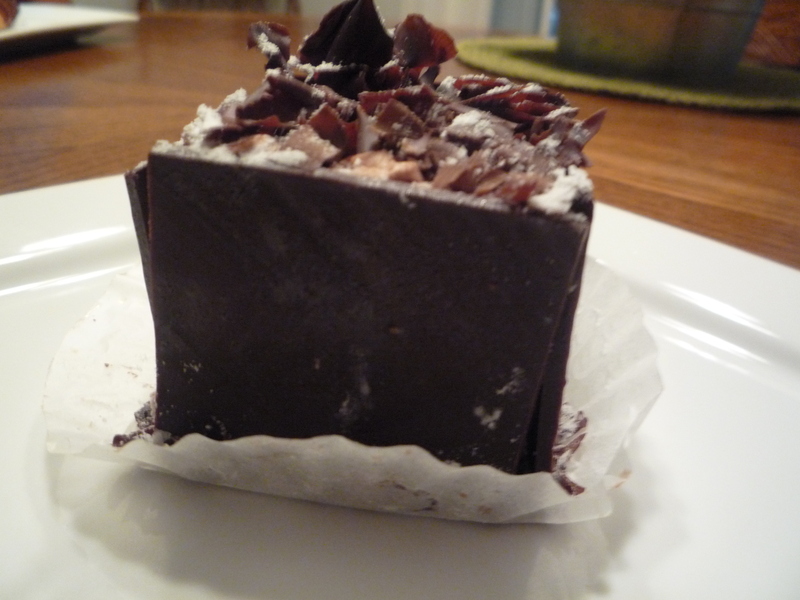 But have heart dear readers….I ate this scrumptuous goodie last night that rocks! Their Mocha Fudge Bar is well worth the drive! It was layered with white cake and mocha mousse…great combo but then wrap that in dark chocolate and you have a home run. Again for $2.50 plus tax, I think it is worth every penny! Yum…yum…yum is all I can say! Just thinking about this and the Reese’s goodie makes me want for more. And you can be sure…I will be buying again from AA!